Valentine's Day is over. Now show some love to your Fairlady Z34. 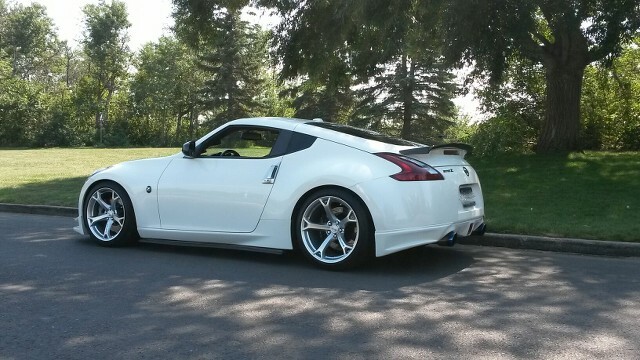 I’ve always liked the concept of the Mine’s spoiler since seeing it as early as (I believe) 2010 and in pictures it looked to be a great add on to the stock 370z sport spoiler. The stock sport spoiler has always been a bit too small for my liking of the naturally wide bodied rear end of the Z34 and seemed to be lacking in style and continuity to the whole rear view of the car. I definitely did not want to overdue it with a much different or particularly larger spoiler change so swapping out the wing would in my opinion take away from the natural aesthetics of the Z car. 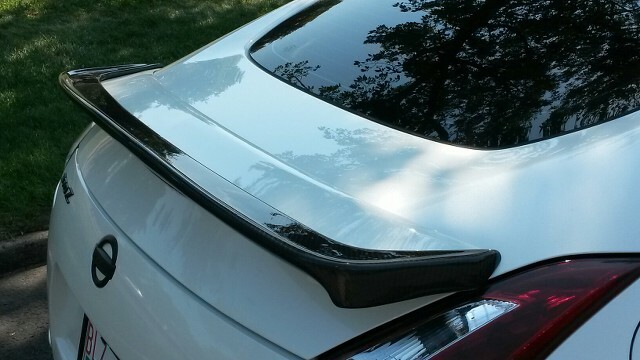 Not to mention just how difficult it is to remove the OEM spoiler and to replace it could end up in several choice cuss words or contracting a professional body shop to the tune of several hundreds of dollars in labor. So the Mine’s spoiler was starting to become the avenue of choice as it would be a perfect addition which, was not overly large and gaudy that would break up the natural curves of the body line, did not require any removal of stock components, and ultimately would accentuate both the car and the stock spoiler just enough to give it the style it should have had direct from the factory. 1. The fact it is required to drill and make holes in the stock spoiler permanently marring the stock spoiler would eliminate any chance of removal of the add on and going back to stock if ever so desired. 2. The tips of the add on Mine’s spoiler seemed somewhat incomplete and stopped a bit short of covering the stock sport spoiler. This made the part stand out as an obvious additional part and took away from what could have been a much more seamless appearance and install. 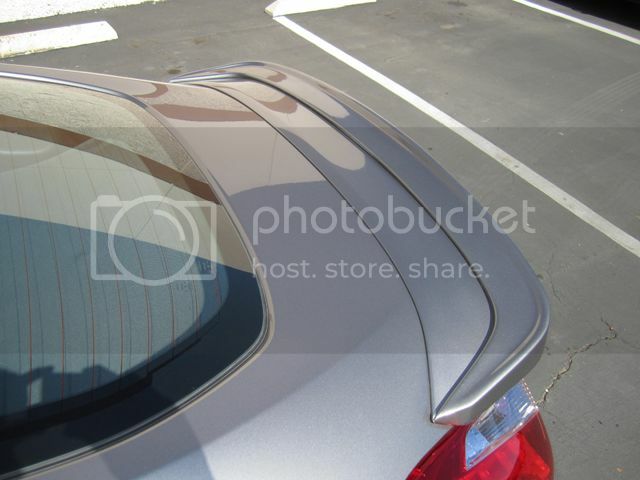 As a consumer choosing a component for my own personal car, these points definitely dissuaded and discouraged me from immediately dropping the $700-$800.00 asking price for the Mine’s Spoiler add on. As time went on, the replicas and close resemblances of the Mine's add on that became available at a bit more affordable pricing point, definitely again enticed me to consider the purchase of this style of product but again I just could not get over what was to me were obvious flaws I just would not be happy with on my own car as the replicas were exact copies and the slight design changes on the close resemblances obscured away from the original design too much for my liking that I again decided against purchasing. About 2-3 years ago, I did however get a chance to modify one of the Mines style spoilers as one of my customers that also for a long time shared the same opinion about the spoiler add on gave in and purchase one for us to install. Since we do Carbon Fiber and Fiberglass work and currently offer complete parts for earlier generation Z cars, he contracted us to fill in the mounting holes and refinish the carbon fiber. After the extensive process, it did not disappoint as the spoiler absolutely gained a much enhanced cleaner look and style compared to its original form however the original design of the Mine’s spoiler where as the tips cut short of the stock wing length was still and glaring presence (an issue unsolvable without refining and redesign that part of the spoiler) And though we have gotten requests to do the same for other customers, it is just not economically viable for customers to purchase a Mine’s spoiler add on or a replica of it and have us do the modifications to it. Long story short and with several suggestions that we should make our own version of the spoiler with the enhancements/modifications already finished, I decided to embark on making the changes in which would eliminate the flaws that prevented me from installing the Mine’s add on spoiler on my own car. The number one goal however was to make sure not to modify the wing so much to take away from what I already felt was a great concept but to perfect and refine to create a much more aesthetically appearing component that required no modification to the car or marring of the OEM spoiler and fitment and finish that flowed more seamlessly with both. When installed it definitely does not follow the natural curves of the OEM sport spoiler and is somewhat of an obvious eyesore when being critical, especially as a fabricator working towards a uniformed curve. Most cannot tell it’s there and most will never look at the spoiler in this manor however since this bump is not necessary, it was definitely something that required smoothing to suit our quality standards and to follow the same lines as the spoiler it is intended to attach to. So after about a year of R&D, testing, and production mold development, the finished product is finally ready. I would like to introduce the new POWERTRIX Sport Spoiler Enhancement (Add On). Manufactured in both Carbon Fiber and Fiberglass models (for paint matching), each spoiler produced is test fitted to an OEM Nissan sport spoiler as part of our regular quality control. Attachment can be achieved with double sided tape or glue like Sikaflex-256 or Loctite Silicone Adhesive. 3. Smoothing of the top plane of the spoiler to match and flow correctly with the OEM spoiler it attaches to. axmea?, 6MT-Z34, Zbrah and 4 others like this. Last edited by Charles@POWERTRIX; 02-15-2019 at 08:14 PM. Very nice. Those holes were the part that always turned me off the Mine's part. I'd like to see a carbon fiber one on a pearl white. Nice work. A definite improvement over Mines. The circled transition looks somewhat awkward to me. I would have extended to a point just above the tail light (if that is even possible). 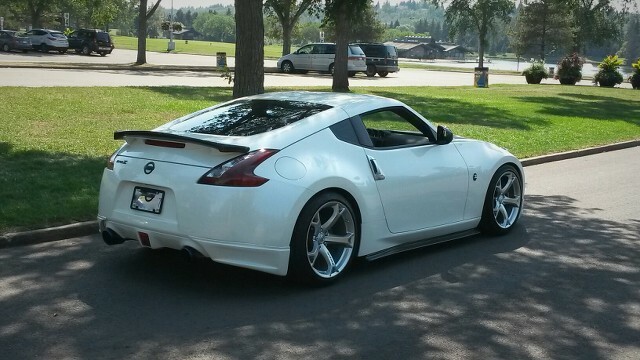 NJZGuy, 6MT-Z34, dkznyc and 2 others like this. Motorsports Manager, Tech Support & EMS Specialist. Yesssss. This is what I was looking for. An add-on to my stock spoiler without drilling holes. We did consider making a modification like this in the prototyping phase however we decided against it. Though it may look nice to continue the spoiler to the tail light from the side view, it would require the extension of the wing too much from the top view (which 99% of the time it is viewed from) and exceed the lines of the stock spoiler. We decided that this variation / addition would take too much away from the original design (our number one goal was to make sure not to deviate too much from the original and natural lines of the car) And we felt extending past the stock spoiler would be too much especially from viewing at its natural vantage point. Looks really good, carbon fiber on PW should look amazing! Thank you Charles - excellent shipping - and great product! Last edited by instroke; 08-17-2015 at 09:55 AM. Looking Good. Thank you and Enjoy. I was thinking about getting the Fly1 Motorsports Type 3 Duckbill Spoiler but now after seeing this LOL. How long does it take to ship out? I too don't want to drill holes in my sport spoiler. Should get to you by Friday the 21st if shipped tomorrow Wed the 19th. This is so tempting....looks really great on PW!! !